A charming metafilm combines technical prowess in filmmaking and phenomenal acting to take an honest look at Hollywood. Michael Keaton and Edward Norton comedically go head-to-head in Alejandro G. Inarritu’s anti-superhero film. Photo courtesy of AceShowBiz. “Birdman,” or “The Unexpected Virtue of Ignorance,” is about as odd a film as the title would suggest, but it is one of the most innovative films in a long time. “Birdman” navigates a comedic and dramatic narrative, featuring doses of magic realism, dark comedy and emotion — too many tricks to be summed up in one film review. The director of “Birdman,” Alejandro Inarritu, is notorious for highly unconventional, depressing films like “21 Grams” and “Babel.” Fortunately, the eccentricity of “Birdman” did not come off as pretentious or painful to watch. This time, in contrast to Inarritu’s previous films, the audience, like Inarritu, is having fun. “Birdman” tells the story of a down-on-his-luck actor, Riggen (Michael Keaton), who, many years ago, became a superstar for his role as Birdman in a blockbuster superhero franchise. Riggen — in part to regain a semblance of his former glory and in part to create something artistic — writes, directs and stars in a Broadway stage adaptation of Raymond Carver’s short story “What We Talk About When We Talk About Love.” We only ever see short snippets of the actual play since it serves mainly as a backdrop to the overall story, but part of the fun of “Birdman” is trying to connect the seemingly incoherent segments. 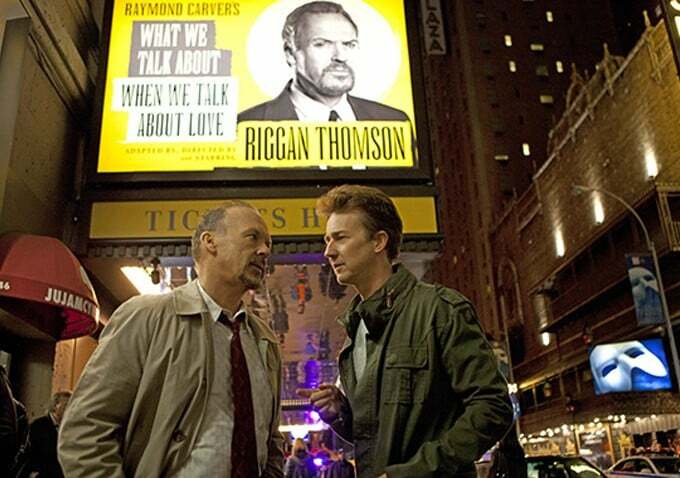 Michael Keaton plays a former A-lister-turned-Broadway-director. Photo courtesy of AceShowBiz. While producing the play, Riggen experiences problems working with Mike (Edward Norton), an arrogant method actor, and familial tension with his recently rehabilitated daughter (Emma Stone). On the surface level, “Birdman” is a drama about a man overcoming adversity and battling his own ego to produce, what is in his mind, a work of art. Throughout the film, a voice inside Riggen’s head, the voice of superhero Birdman, mocks Riggen for attempting to put on a play, urging him to make a comeback in Hollywood with another Birdman sequel. This inner monologue reflects the cinematic binary between art and money. Make no mistake, however; this is not a pretentious art film, but an astute examination of the entertainment industry underlined with dissatisfaction that big blockbusters like “Transformers” get all the attention while not representing anything artistic. In “Birdman,” every aspect of filmmaking is either usefully implemented or cleverly dissected. One of the most impressive ways that this is realized is through the film’s use of a seemingly single, continuous tracking shot for the majority of the film — although special effects were used to connect scenes to look continuous. This technique was not used as a gimmick. The long take makes the film feel almost like a stage play, with everything happening live, giving the film a sense of relentlessness. In this day and age, when anything can be created with CGI, it is refreshing to experience a complicated, high-wire act like “Birdman” that will leave you questioning how it was made. The casting, too, is cleverly done. Michael Keaton, made a celebrity through his role as Batman 25 years ago, phenomenally portrays a character in a similar position as he personally is in. Keaton has not starred in any noteworthy films since “Batman,” and his role as the Dark Knight gave him the chance to be a part of something special. Equally impressive is Edward Norton in his role as Mike, a brash actor who is difficult to work with on set, reflecting Norton’s own personal reputation for being hard to manage. Norton, who once played a superhero with anger issues, the Hulk, marvelously navigates between sympathy and comedic arrogance. “Birdman” is a unique, spell-binding experience that combines everything that is great about film, including excellent performances, innovative filmmaking, originality and great storytelling. It is an honest snapshot of Hollywood. The performances, notably Keaton’s and Norton’s, make this film stand out, but of course the biggest contribution was that of Alejandro Inarritu, who was able to make this unconventional, artistic film one of the most entertaining – and certainly one of the best – films of the year.